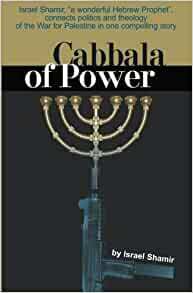 Start reading Cabbala of Power on your Kindle in under a minute. I wish to God that every American adult, especially those who profess to be Christians, would read Israel Shamir's Cabbala of Power, Masters of Discourse and Flowers of Galilee. Shamir is the most intelligent, knowledgeable, prolific and prescient author I have ever encountered. He is a truly remarkable person. It is his love for humanity and especially Palestine and her people that sets him apart from others. I am an old retired US soldier, a Vietnam veteran, and an introvert who has a cynical lack of compassion for others, but I have shed many tears while reading Shamir's accounts of the plight of the Palestinians at the hands of the Jewish usurpers of Palestine. If Americans, especially Christians who unwittingly support Jewish-Zionists would read Shamir's writings, I feel that American's attitudes toward the Jews and the Christian and Muslim indigenous Palestinians would change dramatically. The US has become an aggressive imperial tool in the hands of American and Israeli Jewry, fighting Israel's wars in Iraq, Afghanistan, Libya, Yemen, Pakistan and soon to be Syria and Iran. World Jewry's objective is a New World Order, with their seat of power in Jerusalem, from where the exclusivist Jews will rule with an iron fist over the world's goyim. When that days comes (God forbid) we will all be 'Palestinians' - incarcerated in Gaza-like ghettoes. I know that some who read my comments will attack me as an anti-semite and a NAZI, etc. I say to you - fire away! Call me whatever suits your fancy. ALL THAT I BEG OF YOU IS TO READ ANY OF ISRAEL SHAMIR'S BOOKS, and then post your own review here. ISRAEL SHAMIR'S BOOKS ARE AVAILABLE AT AMAZON. KINDLE EDITIONS ARE .99 CENTS. BEST DEAL YOU WILL EVER MAKE! The author knows his subject very well and draws conclusions that we had better consider carefully.